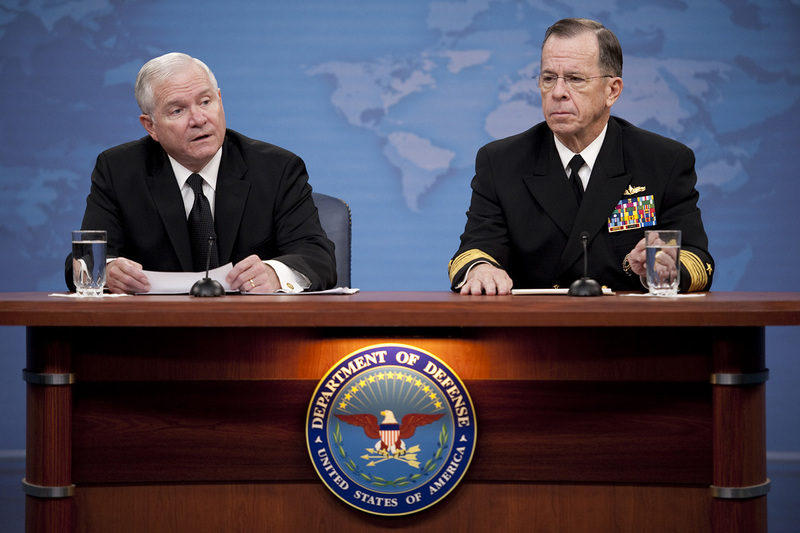 The "Don't Ask, Don't Tell" Comprehensive Working Group report was briefed by Defense Secretary Robert M. Gates and JCS Chairman ADM Mike Mullen on Nov. 30, 2010." The Pentagon study on “Don’t ask, don’t tell” was designed to study how to welcome openly gay Service members into 100% of military units. However, it elicited information that argues against such a one-size-fits-all approach. The study identifies military units in which welcoming gays would be problematic, and it sheds light on what privacy infrastructure will be best to accommodate gays more widely. If Don’t Ask, Don’t Tell is repealed and you are working with a Service member in your immediate unit who has said he or she is gay or lesbian, how, if at all, would it affect your immediate unit’s effectiveness at completing its mission… In a field environment or out to sea? Among all Service members, Marine Corps members were most likely to say they will consider leaving sooner or will leave sooner than planned (38.1%) if repeal occurs. Privacy concerns were the most frequently commented upon issue, regardless of a respondent’s Service. … respondents appeared to be most concerned about the possibility of showering or rooming with someone who was known to the respondent to be gay or lesbian. There’s risk involved … I’m trying to determine how to measure that risk … There is nothing more intimate than young men and young women — and when you talk of infantry, we’re talking our young men — laying out, sleeping alongside of one another and sharing death, fear and loss of brothers. A second factor distinguishing Army and Marine combat units from other units may be the lack of privacy inherent in such combat situations. 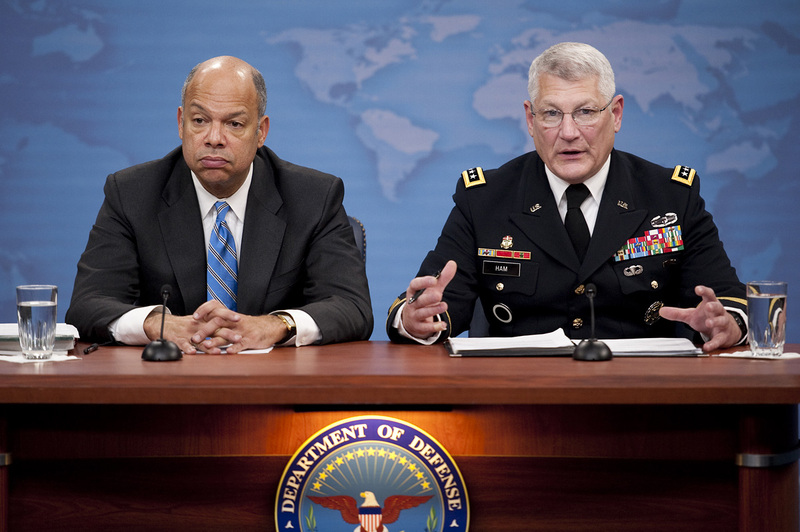 Department of Defense General Counsel Jeh C. Johnson and U.S. Army Gen. Carter Ham chaired the "Don't Ask, Don't Tell" Comprehensive Working Group. Generational change: Reform proponents suggest that “resistance within combat arms groups is likely higher because of older commanders” and therefore the situation will improve as older commanders retire. However, the age data in appendix H for Question 71a shows little effect of age. Familiarity: One of the key implications being claimed from the study is that when straights and gays get familiar with one another, concerns about gays in the military will go away. However, information in appendix P for those who “Served With Gay or Lesbian Service Member” shows the familiarity effect to be tiny. For Question 71a, negative responses drop from 49.5% for those who haven’t served with gays to 43.0% for those with such familiarity. What does the Pentagon study tell us about how we can accommodate gays in the military? The data suggest that a one-size-fits-all approach is not wise. We can open many units to gays quickly but we need to be careful not to require 100% of units to welcome gays quickly. We shouldn’t be pessimistic, however, about changes in familiarity and generational attitudes. Rather than wait passively for familiarity and generational changes to influence behavior, we can improve the underlying problem with advances in privacy infrastructure and thereby lead to genuine change in familiarity and generational attitudes. The need to address the housing and showering arrangements was also the most frequently raised implementation issue in this sample of comments. A better approach is to do what has been implemented at universities over the past few decades: giving everyone more privacy, with widespread availability of single rooms, separate shower stalls and so forth. Much infrastructure of this type has already been added in the military to accommodate women, who are now welcome in 80% of units (volume 1, p. 28). Adding such infrastructure will be practical in some situations and less practical in others, providing another argument against the one-size-fits-all approach to DADT reform. We don’t need to choose between 0% or 100% of units being open to gays. Indeed, both extreme positions are demonstrably silly since there is no good reason to bar gay lawyers from the military and there are clear problems with opening submarines and some Marine units to gays, given current infrastructure. Congress should give the Pentagon the authority to open up units to gays based on the Pentagon’s assessment of their infrastructure for sexual privacy. Using appropriate infrastructure changes we can continue to move forward, as we have for women in the military, to push openness closer and closer to 100%. Jumping right to 100% of units welcoming gays is not the best strategy. It would be particularly tragic if such a push for 100% created a deadlock that left us stuck at 0%. 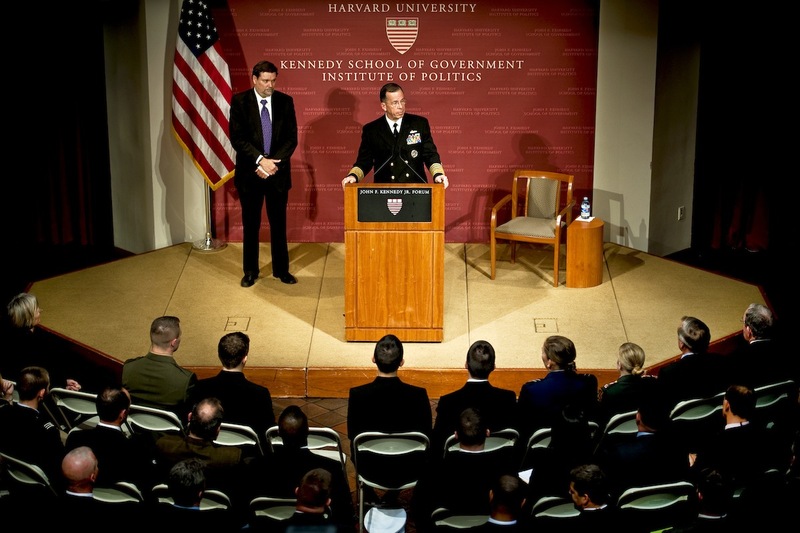 Harvard President Drew Faust and Chairman of the Joint Chiefs of Staff Admiral Michael Mullen made strong statements of support for Harvard ROTC on 17 November 2010. Their support raises two important questions: what do they mean by support for Harvard ROTC, and how can we translate such support into reality. It is my personal belief that Harvard has a responsibility to this nation and its citizens, a responsibility it has embraced since the earliest days of the Republic, with a long tradition of service and more Medal of Honor recipients than any other institution of higher education other than the service academies. We continue to honor that tradition through initiatives like the National Security Fellows here at the Kennedy School and in our tuition assistance for more than 75 veterans across the university in the Yellow Ribbon Program. It is my belief that as a further embodiment of that tradition an ROTC program open to all ought to be fully and formally present on our campus. For it is also my belief that gays and lesbians should have full rights as citizens, including the privilege and the honor of military service … I want to be the president of Harvard who sees the end of “Don’t ask, don’t tell” because I want to be able to take the steps to ensure that any and every Harvard student is able to make the honorable and admirable choice to commit him or herself to the nation’s defense. I think it is incredibly important to have ROTC units at institutions like this. I think President Faust has made it very clear and I certainly would do all in my power to make that happen. Both of these statements are very important. Faust’s statement is important because it address the question of whether opposition to the “Don’t ask, don’t tell” law was merely “a smokescreen for antimilitary bias” on campus, a concern voiced by Harvard professor Ruth R. Wisse. Wisse is undoubtedly right about some faculty members, but President Faust has now made clear that she and others are sincere in their support for ROTC and intend to act on that support. Similarly, Mullen’s statement is important because there are doubts about whether the military would offer ROTC units to Harvard. It costs more to educate an ROTC student at Harvard and there are concerns about how many Harvard students would join ROTC. Furthermore, the military remembers that Harvard effectively barred ROTC in 1969 and remembers “Harvard’s 40-Years of Anti-Army ROTC Rhetoric“. Mullen’s statement is important in announcing that he is willing to work with Faust to transcend that bitterness. Mullen is not alone recognizing the value of graduates of top colleges serving in the military. Gen. David Petraeus has spoken many times of the key roles played by Harvard ROTC graduates in Iraq and Afghanistan. Barack Obama, in a 11 September 2008 campaign appearance at Columbia University, stressed the importance of service by graduates of top colleges. In response to a question about whether elite universities that excluded ROTC should invite it back on campus, he said “Yes … the notion that young people here at Columbia or anywhere, in any university, aren’t offered the choice, the option of participating in military service, I think is a mistake”. To implement the vision of Faust, Mullen, Petraeus and Obama, we need to flesh out the specifics by outlining a blueprint for Harvard ROTC. No unit may be established or maintained at an institution unless the senior commissioned officer of the armed force concerned who is assigned to the program at that institution is given the academic rank of professor… and the institution adopts, as a part of its curriculum, a four-year course of military instruction … which the Secretary of the military department concerned prescribes and conducts. The faculty appointment issue has been solved well at universities comparable to Harvard. At MIT, ROTC leaders are designated as “visiting professors”. At Princeton, ROTC professors are assigned “a rank equivalent to the senior academic rank of professor“. Both these formulations satisfy the law without undermining the status of regular tenured professors. The courses of instruction issue has also been solved in ways that fit with the values of comparable universities. Although it is claimed that “the University would also have to grant credit for ROTC coursework” there is no such requirement in the law. Indeed, Princeton has announced that “credit would not be provided at Princeton” for ROTC courses, despite language in the 1972 Army-Princeton agreement that “academic credit for military professional subjects will be judged by the institution under the same procedure and criteria as for other institutional courses”. Regular faculty arranging ROTC credit: Harvard professors such as Henry Kissinger and Stephen Rosen have taught courses that were coordinated with the military and received ROTC as well as Harvard credit. This model can be expanded; although universities have significant gaps in areas of interest to the military, departments are glad for opportunities to hire top scholars to cover important areas. ROTC faculty arranging university credit: Columbia has discussed having regular university departments co-sponsor ROTC courses deemed worthy of academic credit. With a similar vision, the Army has sent ROTC leaders with PhDs to Princeton, positioning them to have joint appointments in regular departments. Under these models, some courses could be offered with joint Harvard and ROTC credit. Creating an ROTC+ model in which ROTC students get courses in military history, international relations, game theory and anthropology provides to the military a “laboratory of the universities”, and also enhances the course offerings of the university. ROTC+ offers capabilities that are a plus both to the university and the military. Faust spoke of ROTC “on our campus” and Mullen spoke of ROTC “at institutions like this”. Although that could mean an ROTC building at Harvard, in the nearer term it could mean formal recognition of the participation of Harvard students in ROTC at MIT and implementation of the ROTC+ vision. It could also mean an intermediate option such as suggested by the military in 2004 to “post a Captain and a Sergeant on campus, in the Yard, with access, and University support”. What happens will depend on the number of ROTC students, and the number of ROTC students will depend on what happens. The warm endorsements of ROTC by Faust and Mullen are an important step in the “virtuous circle” towards ROTC+ at Harvard. Military leaders often stress that a vision is important, but 90% of the effort is in implementation. A lot depends on the degree to which the university, the military and the alumni are willing to implement an ROTC+ vision. The university is unlikely to move towards the ROTC+ vision until there is some reform of DADT. It is difficult to predict what Congress will do when it receives the Pentagon report on DADT on 30 November. Most discussion has focused on the position of some key stakeholders that 0% of military units should be gay-friendly and and on the position of others that 100% of units should be gay-friendly. However, some on Capitol Hill prefer a centrist option in which the Pentagon would be given authority open up units based on their infrastructure for gender privacy, an approach similar to that used for integration of women into units. If such an incremental centrist approach is taken, the universities will need to decide whether to accept that in the spirit that they’ve accepted the non-100% solution for women in the military. A lot will depend on follow-through by people such as Faust in moving the issue forward. The military will have people who say not to bother with the costs or “high maintenance” of top universities. A lot will depend on the follow-through by people such as Mullen, Petraeus and Obama in stressing the benefits of ROTC+ and service by graduates of top universities, and a lot will depend on calls from leaders in all areas of society for students at top universities to serve. Alumni will also be crucial. Harvard alumni have a strong voice in both the university and in government. Alumni are crucial in encouraging students to apply to Harvard and encouraging them to do ROTC. Alumni are also crucial in transcending bean-counter arguments and providing resources to achieve important goals. Many alumni feel strongly about ROTC. When Harvard restored an ROTC option in 1976 by allowing students to do ROTC at MIT, the Harvard Crimson wrote an editorial opposing ROTC, but an impressive group of 10 editors, including Steven Ballmer ’77 and Grover Norquist ’78 wrote a dissenting editorial supporting ROTC. Senator Robert F. Kennedy ’48 often cited a George Bernard Shaw quote “You see things; and you say, ‘Why?’ But I dream things that never were; and I say, ‘Why not?’” We need a similar attitude in preparing a blueprint for Harvard ROTC. We need to move past the bitterness of 1969 and look past the DADT issue of today. We should dream of having a “Steven Ballmer professor of Game Theory” who teaches a course that gets ROTC credit. We should dream of what such new faculty can do for Harvard, and how such an ROTC+ approach can benefit the military and the country. 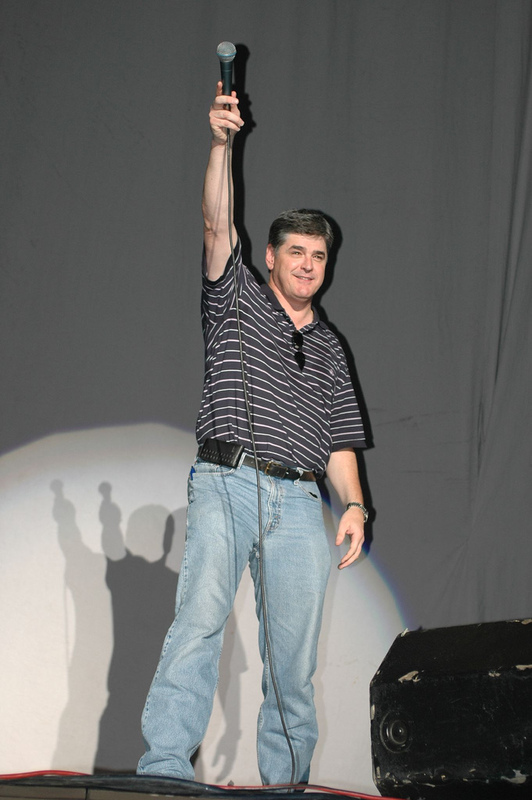 Are Hannity’s Freedom Concerts Exploiting Service Members? Recently Citizens for Responsibility and Ethics in Washington alleged that Sean Hannity’s Freedom Concerts violated its charitable tax status. Specifically the group alleges that Hannity’s Freedom Concerts engaged in deceptive and illegal marketing practices by suggesting that all revenue from concert ticket sales goes to scholarships for the children of killed or wounded service members. CREW and VoteVets, a veteran’s advocacy group, have filed complaints with the IRS and the Federal Trade Commission regarding the Freedom Concerts, the group Freedom Alliance, and the founder of Freedom Alliance, Lt. Col. Oliver North. If you are like me you have probably never heard of these Freedom Concerts which Hannity and the Freedom Alliance put on together. I checked out the website and found out that I could be treated to a show by Michael W. Smith, Lynyrd Skynrd , and Charlie Daniels Band in eight cities including Atlanta, Dallas, and Las Vegas this coming August. According to the website all revenue from concert sales goes to scholarships for service members who have been killed or 100% disabled in an “operational mission or training accident.” However, the information carries the caveat that musical talent, production, promotion, and venue expenses are deducted first. It is unclear to me whether Freedom Alliance included this caveat in its materials before or after the allegations from CREW. Every endeavor, including a charitable one, has expenses but it is the nature of the expenses that is troubling in this instance. CREW and VoteVets alleged at a joint press conference that 80-90% of the money raised at the Freedom Concerts goes to overhead, not scholarships. Debbie Schlussel, a conservative blogger, reported that recently only between 4% and 7% of the money raised went to its primary cause, while millions went to consultants and high end transportation, including private planes, for Hannity. According to Schlussel, the average amount for scholarships during this period? No more than $6,000 for some, and few getting more than $1,000-$2,000. According to its 2006 tax returns, Freedom Alliance’s revenue was $10,822,785 and the organization contributed 3.68% to scholarships or other aid to fallen soldiers. If you are wondering, 3.68% means that out of the millions reported by Freedom Alliance, less than $400,000 of which went to the charity’s principal aim. In 2007 Freedom Alliance got a little better and actually donated 7% or almost $900,000 to seriously wounded soldiers and scholarships. However, this is out of the $12,459,317 raised that year. Schlussel also reported, based on an anonymous source, that North pulled Hannity aside at one of the concerts and told him that the expenses used by Hannity’s entourage had to stop. The expenses reportedly included a Gulfstream 5 to fly Hannity and his family to the concert, several SUVs for transportation to the event, and suites at expensive hotels on location at the event. This information comes from an anonymous source and has been disputed by Freedom Alliance. But perhaps it would be better for Freedom Alliance if these claims are true. Because if they are false, then where is the money? MediaMatters verified the numbers from Schlussel’s story but at the same time acknowledged that Freedom Alliance has a broader mission than the Freedom Concerts and that there is no indication that the millions of dollars are not being spent in some worthwhile endeavor to support that cause. In fact, MediaMatters did not seem to put too much faith in Schlussel’s claims but the tax returns are not great evidence of an upright charity. That takes us back to the complaint filed by CREW. When we compare this to the initial reporting in 2007 on this issue it must lead one to believe that where there is smoke there is fire. But the bigger issue, at least in my opinion, is the lack of serious reporting on this issue by the mainstream media. Blogs have risen in importance recently but why the here today, gone today, interest by the news media? It appears that a major conservative commentator is possible using the war dead and maimed to advance his own career, and no one seems to care. Do the media only care about attacking conservatives when they can score direct political points for liberals? Or, are we reverting back to that dark time when returning soldiers were cast off as an afterthought? I think it might be a little of both. This exploitation of service members has to stop. Is there a role for Veteran’s here? Do we need to do more to protect the legacy of our dead and fallen comrades? By now, many US veterans have completed their spring semesters. They are either moving on to their first post-military jobs, traveling overseas for language study, getting prepped for prestigious internships, or waiting out the storm we call the post-financial crisis job market in America. Either way, this month marks the completion of the first academic year of existence for the Post 9/11 (Chapter 33) GI Bill. The new GI Bill, now open to all honorably discharged veterans (regardless if they ‘invested’ the $1200 upon the beginning of their service), has many advantages over the Chapter 30 Montgomery GI Bill (MGIB), to include BAH payments while in school. Though this all came at a frustrating cost- as payments were months late, differing in amounts, and getting a hold of a VA educational counselor seemed impossible at times. Iraq and Afghanistan Veterans of America (IAVA), a non-profit veteran’s advocacy group has been a strong champion of veteran’s health and education issues in its three years of existence. This year, they meet with numerous Congressmen on the Hill to discuss issues affecting veterans, including the struggle to find civilian jobs and the new GI Bill. Army veteran and Columbia undergraduate student Marco Reininger delivered a testimony to the Senate Veterans Affairs Committee on 21 April 2010, outlining his suggested improvements to GI Bill. The following is an outline of just some of the issues veterans faced this year with the VA’s new Post 9/11 GI Bill. Applying for the new GI Bill. I have to say I was quite shocked upon leaving active duty last spring, when I discovered that I had to ‘apply’ for the GI Bill. I served nearly seven years and was honorably discharged – wasn’t I going to receive the GI Bill automatically? Unfortunately the process was not that simple. VONAPP (Veterans On Line Application) is a site that allows veterans to apply for medical compensation and education benefits online, though has no tracking mechanism to follow the progress of our application. To complicate matters worse, we most likely applied for our benefits in one state, but moved to a different state once school started. I know I experienced some lag time with the transfer of my file (which was done via USPS) when I moved from Georgia to New York to attend graduate school last fall. School certification process. Up until mid-August last summer, no one- veterans, school financial counselors or VA employees- knew what the new tuition rates would be, how the payments would be dispersed, etc. It was an especially nerve-racking time for veterans who were giving up their military life to transition to being a college student, either for the first time or returning to school after their service. We didn’t know whether we needed to take out Federal loans or whether the GI Bill would cover all our costs. 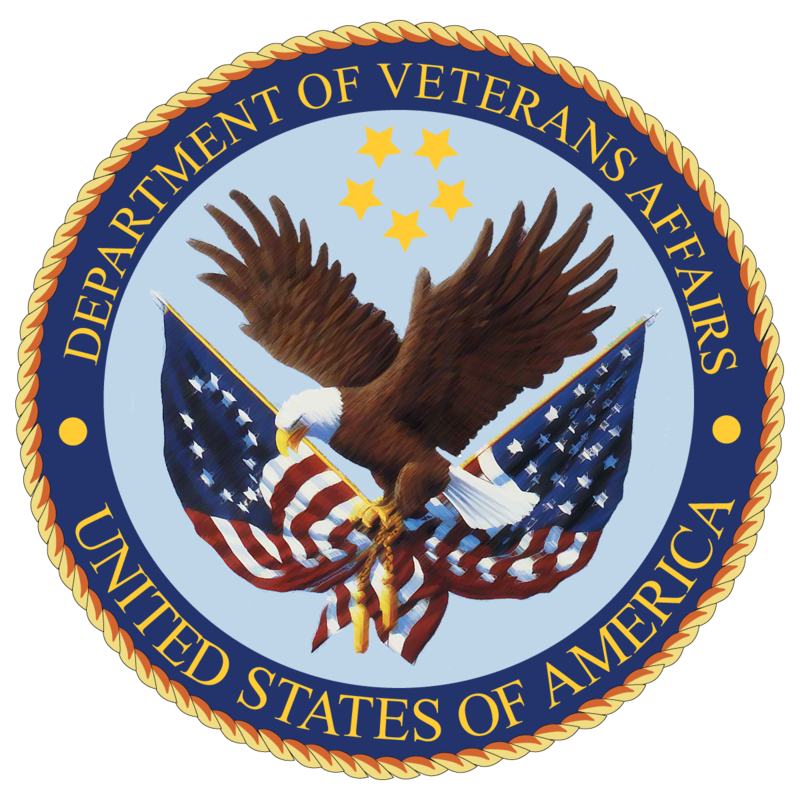 To further complicate matters, the VA had not instituted any formal training for university administrators. Frequently, when calling our university financial aid office, we were directed to the extremely vague VA website. The site makes each process seem very simplistic and streamline, though as any veteran or spouse can tell you, the VA processes are more times than not, anything but simple. My university waited until after the semester drop period to certify our course load, in order to not have to issue amendments in the event that our schedule changed. This meant that the VA was receiving our paperwork nearly one month after the semester began. Again, with no online tracking system, students nor the university were able to see the progress on the paperwork. Bottom Line. The GI Bill is a form of compensation for our service- not a scholarship. There seems to be a misconception with some of our civilian counterparts that we are ‘going to school for free.’ I feel that it is almost universally understood that the men and women of the United States military are severely underpaid for what they are asked to do for their country. They do what many can’t or won’t. The GI Bill is a small payback to the brave men and women for all their sacrifices. When the systems in place cause so much frustration in order to utilize these resources, it sends the signal that the government is not willing to take the extra time to properly recognize our veterans. In addition, the universities need to expand their knowledge on veteran’s issues. They need to understand that although many do not have the wounds of war physically apparent, they will carry pieces with them for the rest of their lives. Around one in three hundred people in the US today have served. Yet, you will find a much greater proportion in college today. That goes to show the determination and high goals veterans have for themselves. Luckily, there are those who support the vets tirelessly. In early June, the Chairman of the Senate Veterans’ Affairs Committee, Daniel Akaka (D-Hawaii) introduced the Post-9/11 Veterans Educational Assistance Improvements Act. Although it does not fully address the personnel and customer service improvements needed within the Veterans Administration, it does aim to open up benefits to guard/reserve and allow active duty service members to receive the book stipend, which is not covered by tuition assistance. Finally, the veterans need to stay informed. Read the VA website as often as possible. Reach out to fellow student veterans. Contact your representative or senator to push for enhanced legislation. Complacency will not help improve the system for our friends, children, or grandchildren. We fought together in battle; there is no reason for us not to continue to band together towards these benefits.